Distributed workers - just like their on-site counterparts - need to collaborate with coworkers, partners and customers to stay productive. But in today's global business climate, frequent travel is no longer a viable option. 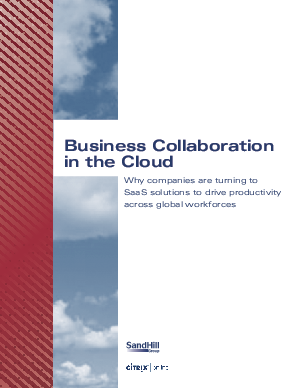 This new SandHill Group white paper explores recent study findings to better understand the powerful advantages of SaaS technologies in addressing the challenges of a global market, virtual teams and an ever-changing business climate.